Own you own Gold Plating Business. The 2001 and 2002 systems allow the operator to apply 24 carat hard gold, nickel, copper etc. to most metal surfaces and some non-metal surfaces. Car Badges, Taps, Door Handles etc and all be plated in position saving hours of labour and costs. Previously gold plated items can be re-plated and silver jewellery can be transformed into rich 24 ct gold. Excellent returns can be enjoyed with these systems. 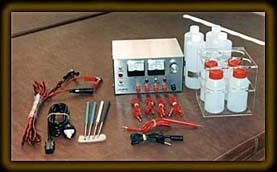 Both systems are supplied with a comprehensive training manual, accessories, chemicals and gold solution. Everything you need to commence your business. Further supplies of materials are available from stock. 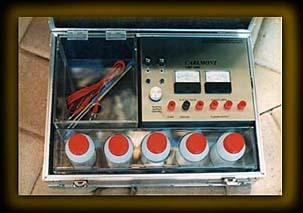 The 2001 System operates from 240 v. mains supply or external car battery. The 2002 has a built in power supply and is completely portable.